Visitors and residents will soon be able to experience Allerdale’s best attractions from their own homes. Allerdale Borough Council today [29 November] unveiled its suite of virtual reality films and videos which will be used to showcase the area – attracting tourists and investment to the area. Some 20 VR films have been created, giving users experiences like walking the via ferrata at Honister slate mine, eating a meal at the Kirkstile Inn in Loweswater, or cycling through the forest at Whinlatter forest park or along the Solway coast cycle path to Allonby. These are accompanied by a series of promotional videos on a number of topics, including exploring the outdoors and eating out. There is also a video targeted at the growing Chinese market, which is narrated in Mandarin. 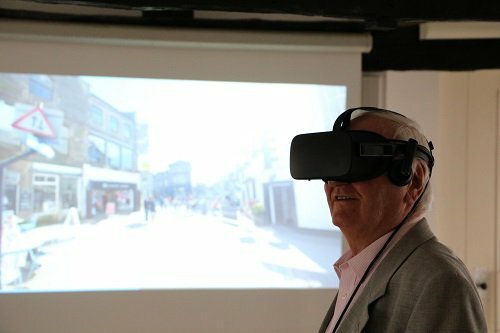 Funders and supporters of the project were able to experience the VR and get a first-glimpse of the videos at an event held at Keswick’s Moot Hall, before they are publicly launched in a few week’s time. The £53,000 project is being funded by the European Agricultural Fund for Rural Development's LEADER programme and the money has gone towards the development costs of the videos and the purchase of virtual reality headsets. The videos and software will be made available to the public in tourist information centres across the borough, at Carlisle Lake District Airport, at travel shows and events, and available to view on the new tourism-focused Visit Allerdale website, www.visitallerdale.co.uk . They will also be available on YouTube and local businesses and attractions will be able to link to the promotional videos free of charge from their own websites. The European Agriculture Fund for Rural Development's LEADER programme provides European Union funding to projects. The grant provided is to support a project to fund the creation of a number of themed videos and virtual reality experience that will be accessible via the Destination Allerdale website to encourage visitors to access some of the currently less visited areas of Allerdale.